The formation of the Lithuanian Native breed took place in the ethnic lands of Lithuania and was mostly influenced by the interaction of local short eared and long eared pigs and some cultural breeds. 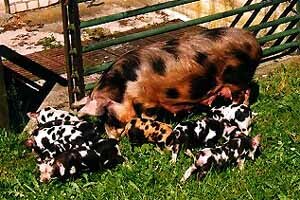 Native pigs are diverse in color: white, black, tan, but mostly multicolored. 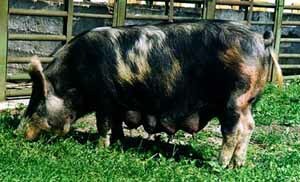 The breeding of colored pigs has been most prolonged in the southeastern districts of Lithuania, where buckwheat was grown. Buckwheat chaff highly increased sensitivity of white pigs to sunlight, and only colored pigs could be fed on buckwheat chaff and pastured. Most of the native pigs still have a characteristic feature - the beads hanging under the neck. Native Lithuanian pigs have an average body length, strong constitution and are tolerant and undemanding as regards feeding and housing conditions. Their skin is thicker and with longer bristles than Lithuanian White pigs. The weight of adult boars and sows are 260 and 180 kg, respectively. The height measurements are 80-90 and 76-80 cm, respectively. Fattening pigs gain daily about 600 g, carcass length is 92.5 cm and average backfat thickness at 100 kg is 34.8 mm. Average litter size is 11.4 pigs, litter weight at 21 day 43.2 kg. In recent years the Lithuanian native breed was found to be on the verge of extinction. At the end of 1994, remaining specimens were collected and the herd established at Lithuanian Institute of Animal Science. The resulting herd of approximately 160 pigs, including 30 sows and 9 boars, is a closed population with matings being made only to other individuals within the herd. This is done in order to preserve the genetic integrity of the breeding herd. Dr Violeta Juskiene, Lithuanian Institute of Animal Science, 12 Zebenkos, 5125 Baisogala, Lithuania.